Because of the potential risk of toxicity from the large amount of the excipient, propylene glycol, AGENERASE Oral Solution is contraindicated in infants and children below the age of 4 years, pregnant women, patients with hepatic or renal failure, and patients treated with disulfiram or metronidazole (see CONTRAINDICATIONS AND WARNINGS ). AGENERASE Oral Solution should be used only when AGENERASE Capsules or other protease inhibitor formulations are not therapeutic options. AGENERASE Oral Solution is for oral administration. One milliliter (1 mL) of AGENERASE Oral Solution contains 15 mg of amprenavir in solution and the inactive ingredients acesulfame potassium, artificial grape bubblegum flavor, citric acid (anhydrous), d-alpha tocopheryl polyethylene glycol 1000 succinate (TPGS), menthol, natural peppermint flavor, polyethylene glycol 400 (PEG 400) (170 mg), propylene glycol (550 mg), saccharin sodium, sodium chloride, and sodium citrate (dihydrate). Solutions of sodium hydroxide and/or diluted hydrochloric acid may have been added to adjust pH. Each mL of AGENERASE Oral Solution contains 46 IU vitamin E in the form of TPGS. Propylene glycol is in the formulation to achieve adequate solubility of amprenavir. The recommended daily dose of AGENERASE Oral Solution of 22.5 mg/kg twice daily corresponds to a propylene glycol intake of 1,650 mg/kg/day. Acceptable intake of propylene glycol for pharmaceuticals has not been established. Increases in the area under the plasma concentration versus time curve (AUC) after single oral doses between 150 and 1,200 mg were slightly greater than dose proportional. Increases in AUC were dose proportional after 3 weeks of dosing with doses from 300 to 1,200 mg twice daily. The pharmacokinetic parameters after administration of amprenavir 1,200 mg twice daily for 3 weeks to HIV-infected subjects are shown in Table 1. Distribution: The apparent volume of distribution (V z /F) is approximately 430 L in healthy adult subjects. In vitro binding is approximately 90% to plasma proteins. The high affinity binding protein for amprenavir is alpha 1 -acid glycoprotein (AAG). The partitioning of amprenavir into erythrocytes is low, but increases as amprenavir concentrations increase, reflecting the higher amount of unbound drug at higher concentrations. AGENERASE Oral Solution contains a large amount of propylene glycol, which is hepatically metabolized by the alcohol and aldehyde dehydrogenase enzyme pathway. Alcohol dehydrogenase (ADH) is present in the human fetal liver at 2 months of gestational age, but at only 3% of adult activity. Although the data are limited, it appears that by 12 to 30 months of postnatal age, ADH activity is equal to or greater than that observed in adults. Additionally, certain patient groups (females, Asians, Eskimos, Native Americans) may be at increased risk of propylene glycol-associated adverse events due to diminished ability to metabolize propylene glycol (see CLINICAL PHARMACOLOGY : Special Populations : Gender and Race ). Special Populations: Hepatic Insufficiency: AGENERASE Oral Solution is contraindicated in patients with hepatic failure. Patients with hepatic impairment are at increased risk of propylene glycol-associated adverse events (see WARNINGS ). AGENERASE Oral Solution should be used with caution in patients with hepatic impairment. AGENERASE Capsules have been studied in adult patients with impaired hepatic function using a single 600-mg oral dose. The AUC 0-(infinity) was significantly greater in patients with moderate cirrhosis (25.76 ± 14.68 mcg·hr/mL) compared with healthy volunteers (12.00 ± 4.38 mcg·hr/mL). The AUC 0-(infinity) and C max were significantly greater in patients with severe cirrhosis (AUC 0-(infinity) : 38.66 ± 16.08 mcg·hr/mL; C max : 9.43 ± 2.61 mcg/mL) compared with healthy volunteers (AUC 0-(infinity) : 12.00 ± 4.38 mcg·hr/mL; C max : 4.90 ± 1.39 mcg/mL). Patients with impaired hepatic function require dosage adjustment (see DOSAGE AND ADMINISTRATION ). Renal Insufficiency: AGENERASE Oral Solution is contraindicated in patients with renal failure. Patients with renal impairment are at increased risk of propylene glycol-associated adverse events. Additionally, because metabolites of the excipient, propylene glycol, in AGENERASE Oral Solution may alter acid-base balance, patients with renal impairment should be monitored for potential adverse events (see WARNINGS ). AGENERASE Oral Solution should be used with caution in patients with renal impairment. The impact of renal impairment on amprenavir elimination has not been studied. The renal elimination of unchanged amprenavir represents <3% of the administered dose. Pediatric Patients: AGENERASE Oral Solution is contraindicated in infants and children below 4 years of age (see CONTRAINDICATIONS and WARNINGS ). The pharmacokinetics of amprenavir have been studied after either single or repeat doses of AGENERASE Capsules or Oral Solution in 84 pediatric patients. Twenty HIV-1-infected children ranging in age from 4 to 12 years received single doses from 5 mg/kg to 20 mg/kg using 25-mg or 150-mg capsules. The C max of amprenavir increased less than proportionally with dose. The AUC 0-(infinity) increased proportionally at doses between 5 and 20 mg/kg. Amprenavir is 14% less bioavailable from the liquid formulation than from the capsules; therefore AGENERASE Capsules and AGENERASE Oral Solution are not interchangeable on a milligram-per-milligram basis. Gender: The pharmacokinetics of amprenavir do not differ between males and females. Females may have a lower amount of alcohol dehydrogenase compared with males and may be at increased risk of propylene glycol-associated adverse events; no data are available on propylene glycol metabolism in females. Race: The pharmacokinetics of amprenavir do not differ between blacks and non-blacks. Certain ethnic populations (Asians, Eskimos, and Native Americans) may be at increased risk of propylene glycol-associated adverse events because of alcohol dehydrogenase polymorphisms; no data are available on propylene glycol metabolism in these groups. ** Compared to amprenavir capsules 1,200 mg b.i.d. in the same patients. *** Median percent change; confidence interval not reported. ^ = Increase; \/ = Decrease; <-> = No change (up or down<10%); NA = C min not calculated for single-dose study. ^ = Increase; \/ = Decrease; <-> = No change (up or down<10%); NA = C min not calculated for single-dose study; ND = Interaction cannot be determined as C min was below the lower limit of quantitation. 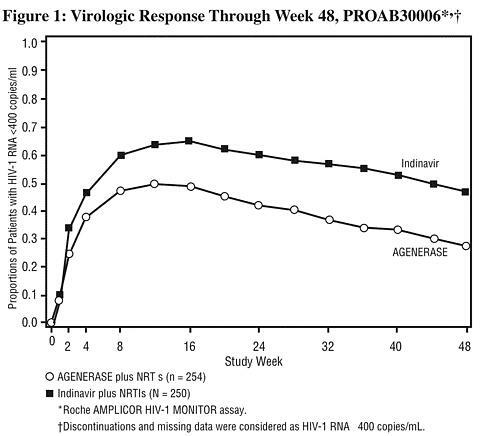 HIV Protease Inhibitors: Concurrent use of AGENERASE Oral Solution and NORVIR ® (ritonavir) Oral Solution is not recommended because the large amount of propylene glycol in AGENERASE Oral Solution and ethanol in NORVIR Oral Solution may compete for the same metabolic pathway for elimination. This combination has not been studied in pediatric patients. The effect of amprenavir on total drug concentrations of other HIV protease inhibitors in subjects receiving both agents was evaluated using comparisons to historical data. Indinavir steady-state C max , AUC, and C min were decreased by 22%, 38%, and 27%, respectively, by concomitant amprenavir. Similar decreases in C max and AUC were seen after the first dose. Saquinavir steady-state C max , AUC, and C min were increased 21%, decreased 19%, and decreased 48%, respectively, by concomitant amprenavir. Nelfinavir steady-state C max , AUC, and C min were increased by 12%, 15%, and 14%, respectively, by concomitant amprenavir. ** Virological failures at or before Week 48. *** Considered to be treatment failure in the analysis. Because of the potential risk of toxicity from the large amount of the excipient, propylene glycol, AGENERASE Oral Solution is contraindicated in infants and children below the age of 4 years, pregnant women, patients with hepatic or renal failure, and patients treated with disulfiram or metronidazole (see WARNINGS and PRECAUTIONS ). If AGENERASE Capsules are coadministered with ritonavir capsules, the antiarrhythmic agents flecainide and propafenone are also contraindicated. Because of the potential risk of toxicity from the large amount of the excipient, propylene glycol, AGENERASE Oral Solution is contraindicated in infants and children below the age of 4 years, pregnant women, patients with hepatic or renal failure, and patients treated with disulfiram or metronidazole (see CLINICAL PHARMACOLOGY, CONTRAINDICATIONS, and PRECAUTIONS ). Because of the possible toxicity associated with the large amount of propylene glycol and the lack of information on chronic exposure to large amounts of propylene glycol, AGENERASE Oral Solution should be used only when AGENERASE Capsules or other protease inhibitor formulations are not therapeutic options. Certain ethnic populations (Asians, Eskimos, Native Americans) and women may be at increased risk of propylene glycol-associated adverse events due to diminished ability to metabolize propylene glycol; no data are available on propylene glycol metabolism in these groups (see CLINICAL PHARMACOLOGY : Special Populations: Gender and Race ). If patients require treatment with AGENERASE Oral Solution, they should be monitored closely for propylene glycol-associated adverse events, including seizures, stupor, tachycardia, hyperosmolality, lactic acidosis, renal toxicity, and hemolysis. Patients should be switched from AGENERASE Oral Solution to AGENERASE Capsules as soon as they are able to take the capsule formulation. Concurrent use of AGENERASE Oral Solution and NORVIR (ritonavir) Oral Solution is not recommended because the large amount of propylene glycol in AGENERASE Oral Solution and ethanol in NORVIR Oral Solution may compete for the same metabolic pathway for elimination. Use of alcoholic beverages is not recommended in patients treated with AGENERASE Oral Solution. Severe and life-threatening skin reactions, including Stevens-Johnson syndrome, have occurred in patients treated with AGENERASE (see ADVERSE REACTIONS ). Acute hemolytic anemia has been reported in a patient treated with AGENERASE. General: AGENERASE Capsules and AGENERASE Oral Solution are not interchangeable on a milligram-per-milligram basis (see CLINICAL PHARMACOLOGY: Pediatric Patients and CONTRAINDICATIONS ). Lipid Elevations: Treatment with AGENERASE alone or in combination with ritonavir capsules has resulted in increases in the concentration of total cholesterol and triglycerides. Triglyceride and cholesterol testing should be performed prior to initiation of therapy with AGENERASE and at periodic intervals during treatment. Lipid disorders should be managed as clinically appropriate. See PRECAUTIONS Table 8: Established and Other Potentially Significant Drug Interactions for additional information on potential drug interactions with AGENERASE and HMG-CoA reductase inhibitors. Information for Patients: A statement to patients and healthcare providers is included on the product's bottle label: ALERT: Find out about medicines that should NOT be taken with AGENERASE. A Patient Package Insert (PPI) for AGENERASE Oral Solution is available for patient information. AGENERASE Oral Solution is contraindicated in infants and children below the age of 4 years, pregnant women, patients with hepatic or renal failure, and patients treated with disulfiram or metronidazole. AGENERASE Oral Solution should be used only when AGENERASE Capsules or other protease inhibitor formulations are not therapeutic options. Patients treated with AGENERASE Capsules should be cautioned against switching to AGENERASE Oral Solution because of the increased risk of adverse events from the large amount of propylene glycol in AGENERASE Oral Solution. Women, Asians, Eskimos, or Native Americans, as well as patients who have hepatic or renal insufficiency, should be informed that they may be at increased risk of adverse events from the large amount of propylene glycol in AGENERASE Oral Solution. Patients should be advised that drinking alcoholic beverages is not recommended while taking AGENERASE Oral Solution. Patients receiving sildenafil should be advised that they may be at an increased risk of sildenafil-associated adverse events including hypotension, visual changes, and priapism, and should promptly report any symptoms to their doctor. Adult and pediatric patients should be advised not to take supplemental vitamin E since the vitamin E content of AGENERASE exceeds the Reference Daily Intake (adults 30 IU, pediatrics approximately 10 IU). Laboratory Tests: The combination of AGENERASE and low-dose ritonavir has been associated with elevations of cholesterol and triglycerides, SGOT (AST), and SGPT (ALT) in some patients. Appropriate laboratory testing should be considered prior to initiating combination therapy with AGENERASE and ritonavir capsules and at periodic intervals or if any clinical signs or symptoms of hyperlipidemia or elevated liver function tests occur during therapy. For comprehensive information concerning laboratory test alterations associated with ritonavir, physicians should refer to the complete prescribing information for NORVIR (ritonavir). Drug Interactions: See also CONTRAINDICATIONS, WARNINGS, and CLINICAL PHARMACOLOGY: Drug Interactions. CONTRAINDICATED due to potential risk of toxicity from the large amount of the excipient, propylene glycol, in AGENERASE Oral Solution. The dose of amprenavir should be reduced when used in combination with ritonavir capsules (see DOSAGE AND ADMINISTRATION ). Also, see the full prescribing information for NORVIR for additional drug interaction information. Concentrations of warfarin may be affected. It is recommended that INR (international normalized ratio) be monitored. Concomitant use of trazodone and AGENERASE with or without ritonavir may increase plasma concentrations of trazodone. Adverse events of nausea, dizziness, hypotension, and syncope have been observed following coadministration of trazodone and ritonavir. If trazodone is used with a CYP3A4 inhibitor such as AGENERASE, the combination should be used with caution and a lower dose of trazodone should be considered. Concomitant use of fluticasone propionate and AGENERASE/ritonavir) may increase plasma concentrations of fluticasone propionate, resulting in significantly reduced serum cortisol concentrations. Coadministration of fluticasone propionate and AGENERASE/ritonavir is not recommended unless the potential benefit to the patient outweighs the risk of systemic corticosteroid side effects (see WARNINGS ). Carcinogenesis and Mutagenesis: Amprenavir was evaluated for carcinogenic potential by oral gavage administration to mice and rats for up to 104 weeks. Daily doses of 50, 275 to 300, and 500 to 600 mg/kg/day were administered to mice and doses of 50, 190, and 750 mg/kg/day were administered to rats. Results showed an increase in the incidence of benign hepatocellular adenomas and an increase in the combined incidence of hepatocellular adenomas plus carcinoma in males of both species at the highest doses tested. Female mice and rats were not affected. These observations were made at systemic exposures equivalent to approximately 2 times (mice) and 4 times (rats) the human exposure (based on AUC 0-24 hr measurement) at the recommended dose of 1,200 mg twice daily. Administration of amprenavir did not cause a statistically significant increase in the incidence of any other benign or malignant neoplasm in mice or rats. It is not known how predictive the results of rodent carcinogenicity studies may be for humans. However, amprenavir was not mutagenic or genotoxic in a battery of in vitro and in vivo assays including bacterial reverse mutation (Ames), mouse lymphoma, rat micronucleus, and chromosome aberrations in human lymphocytes. Pregnancy and Reproduction: AGENERASE Oral Solution is contraindicated during pregnancy due to the potential risk of toxicity to the fetus from the high propylene glycol content. Therefore, if AGENERASE is used in pregnant women, the AGENERASE Capsules formulation should be used (see complete prescribing information for AGENERASE Capsules). Pediatric Use: AGENERASE Oral Solution is contraindicated in infants and children below the age of 4 years due to the potential risk of toxicity from the excipient, propylene glycol (see CONTRAINDICATIONS and WARNINGS ). Alcohol dehydrogenase (ADH), which metabolizes propylene glycol, is present in the human fetal liver at 2 months of gestational age, but at only 3% of adult activity. Although the data are limited, it appears that by 12 to 30 months of postnatal age, ADH activity is equal to or greater than that observed in adults. Two hundred fifty-one patients aged 4 and above have received amprenavir as single or multiple doses in studies. An adverse event profile similar to that seen in adults was seen in pediatric patients. Concurrent use of AGENERASE Oral Solution and NORVIR (ritonavir) Oral Solution is not recommended because the large amount of propylene glycol in AGENERASE Oral Solution and ethanol in NORVIR Oral Solution may compete for the same metabolic pathway for elimination. This combination has not been studied in pediatric patients. Concomitant Therapy With Ritonavir: Tables 10 and 11 present adverse clinical events and laboratory abnormalities observed in subjects who received AGENERASE plus ritonavir. Since the trials were small, open-label, of varying duration, and often included different patient populations, direct comparisons to the frequency of events with AGENERASE Capsules alone (see Table 9) cannot be made. ** Data from 3 open-label studies in treatment-naive and treatment-experienced patients receiving combination antiretroviral therapy. AGENERASE Oral Solution contains large amounts of propylene glycol. In the event of overdosage, monitoring and management of acid-base abnormalities is recommended. Propylene glycol can be removed by hemodialysis. AGENERASE may be taken with or without food; however, a high-fat meal decreases the absorption of amprenavir and should be avoided (see CLINICAL PHARMACOLOGY : Effects of Food on Oral Absorption ). Adult and pediatric patients should be advised not to take supplemental vitamin E since the vitamin E content of AGENERASE Oral Solution exceeds the Reference Daily Intake (adults 30 IU, pediatrics approximately 10 IU) (see DESCRIPTION ). The recommended dose of AGENERASE Oral Solution based on body weight and age is shown in Table 12. Consideration should be given to switching patients from AGENERASE Oral Solution to AGENERASE Capsules as soon as they are able to take the capsule formulation (see WARNINGS ). Concomitant Therapy: Concurrent use of AGENERASE Oral Solution and NORVIR (ritonavir) Oral Solution is not recommended because the large amount of propylene glycol in AGENERASE Oral Solution and ethanol in NORVIR Oral Solution may compete for the same metabolic pathway for elimination. Patients with Hepatic Impairment: AGENERASE Oral Solution is contraindicated in patients with hepatic failure (see CONTRAINDICATIONS ). Patients with hepatic impairment are at increased risk of propylene glycol-associated adverse events (see WARNINGS ). AGENERASE Oral Solution should be used with caution in patients with hepatic impairment. Based on a study with AGENERASE Capsules, adult patients with a Child-Pugh score ranging from 5 to 8 should receive a reduced dose of AGENERASE Oral Solution of 513 mg (34 mL) twice daily, and adult patients with a Child-Pugh score ranging from 9 to 12 should receive a reduced dose of AGENERASE Oral Solution of 342 mg (23 mL) twice daily (see CLINICAL PHARMACOLOGY : Hepatic Insufficiency ). AGENERASE Oral Solution has not been studied in children with hepatic impairment. Renal Insufficiency: AGENERASE Oral Solution is contraindicated in patients with renal failure (see CONTRAINDICATIONS ). Patients with renal impairment are at increased risk of propylene glycol-associated adverse events. AGENERASE Oral Solution should be used with caution in patients with renal impairment (see WARNINGS ). AGENERASE Oral Solution, a clear, pale yellow to yellow, grape-bubblegum-peppermint-flavored liquid, contains 15 mg of amprenavir in each 1 mL. Bottles of 240 mL with child-resistant closures (NDC 0173-0687-00). This product does not require reconstitution.